The various shapes and sizes of beer glassware play a meaningful role in your enjoyment. Some non-style-specific glassware used in drinking games and other sport drinking can provide the unsuspecting drinker with a challenging and often surprising outcome. Please don’t try drinking from these glasses at home! Yard glass (or yard-of-ale or aleyard): The yard glass holds about 2-1/2 pints of beer. 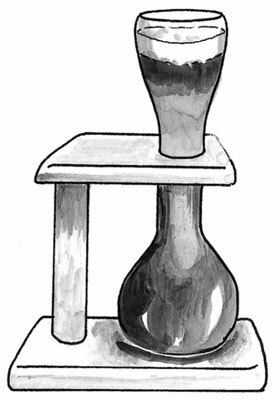 The yard glass is, well, a yard (3 feet) tall with a bell-shaped top, a ball-shaped bottom, and a long, skinny body. The yard glass also comes in a half-yard size. 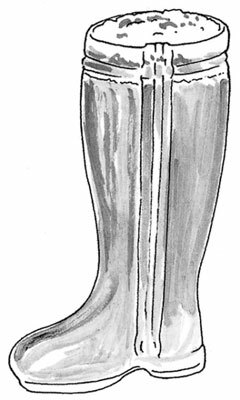 Stiefel (or boot): The Stiefel is literally a glass in the shape of a boot. It can vary in size but commonly holds 4 to 5 pints of beer. The Stiefel is popular among young fraternal groups because it’s meant for communal drinking (and whoever takes the last gulp buys the next round). Drinking from a boot filled with beer presents a problem similar to that of a yard glass. The solution? Drink with the toe pointed horizontally. Kwak glass: Another glassware oddity, the Kwak glass, is a drinking receptacle made specially for a single brand. The Belgian brewer of the dark and richly herbal Kwak Bier encourages bar owners to serve this beer in the famous Kwak glass. This glass stands about 1 foot high and is part Weizen beer glass, part yard glass. Because of its shape and size, the Kwak glass can’t stand up without its own supportive wooden frame. Together, glass and frame represent a fair investment on the part of the brewer. To keep customers from making the Kwak glass part of their personal collections, many Belgian bartenders require one of the customer’s shoes as a security deposit on the glass.